It is a sad fact that there simply aren't enough safe havens for every abused, unwanted or abandoned guinea pig in need of a good home. Luckily there are a number of organized rescues and kind individuals who are willing to take in such guinea pigs, care for them and try to find them wonderful homes of their own. We'd like to help spead the word about guinea pigs rescued or fostered by others in Minnesota and nearby. If you are looking for a guinea pig, please think about contacting the folks below to see if they have the perfect cutie for you. Thank you for considering a rescued guinea pig as a new member of your family! Abigal and Madeline are two lovely American sows hoping to find a safe caring home where they will be loved and cherished. These girls are probably sisters as well as BBF (Best Friends Forever) and must be adopted together. Both have short smooth coats. Abigal is mostly white with big lemon agouti (dark hair tipped with cream) eye patches. Madeline is lovely warm golden agouti (dark hair tipped with red), red and white. Both have dark eyes. Abby is the larger of the two girls, Maddy often hides behind her bigger buddy when she thinks something suspicious is going on nearby. 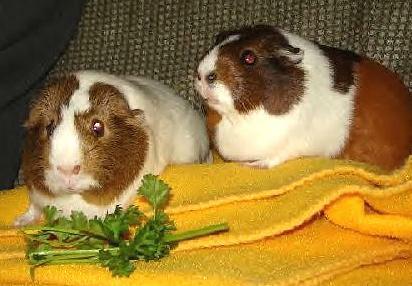 Abigal and Madeline were taken in by Jack Pine Guinea Pig Rescue on 2/6/06. The sows were originally taken to a humane society when their owners tired of them, but because Abby and Maddy were so frightened at that time the humane society was unable to adopt them out and asked JPGPR to take them. However, even when very frightened or anxious, Abby and Maddy never did try to bite. With lots of TLC and gentle secure handling from their foster "mom and dad", Abigal and Madeline have become much more sociable and comfortable with their humans. They are now much easier to get out of their cage and seem to enjoy attention and snuggling. The girls may not be quite ready yet to sit on a lap through an entire episode of Lost or CSI, but they're getting there. According to Stephanie, Abby and Maddy's foster mom, the girls can be swayed to visit longer when small treats of fresh veggies are offered. Abigal and Madeline are currently being fostered by Stephanie through Twin Cities Guinea Pig Rescue where they're receiving tons of special attention and socializing from their wonderful foster mom. Stephanie and her husband have worked hard on building up the sow's confidence and comfort level for cuddling. Abby and Maddy have come a long way already and continued one-on-one attention will help them get better and better at "hanging out" with their human beans. The girls are becoming social butterflies! Below is a cute example Stephanie shared of how well the girls are interacting now: They have become so interactive and are really ready to attach to "their" human. One night, Mike and I were sitting in the bedroom. Abby waddled out of her pigloo and came right to the side of the cage. She stuck her little nose just above the coroplast. It was pretty cute, so I said "Hi Abby". She responded with a huge WHHHEEEEEKK! I was surprised, so I said "How are you?" Again, a loud wheek was the answer. We continued on like this for about 5 minutes. I had just refilled everything, so I knew she wasn't asking for anything, she just wanted to interact. Likewise, when we got back from vacation, we walked into the bedroom, and out they came, wheeking their hello back to us. It is important for adopters to know that Abigal and Madeline are shy pigs, but they undoubtedly want to bond with that special human. Potential adopters must understand that these girls will be shy and require a little extra effort and one-on-one attention to open up and trust, but once they do - they will be great pigs for an adult human or two. Abby and Maddy cannot be adopted to a family with young children. There were very young children in their previous home and I suspect rough handling from the youngsters is why these sows were so "unsociable." Tiki & Twix first came to Twin Cities Guinea Pig Rescue in early October of 2006. They had been surrendered together because their former family no longer wanted the responsibility of caring for them. The girls were adopted that same month but were "returned" to the rescue 5 months later in early March 2007. Their adoptive family was no longer able to care for them. These two petite sows are very curious and sweet, and have been adjusting well to their new surroundings back in foster care. Most likely sisters, the girls are about seven months old. Twix, a chocolate/white/cream short hair, is the bold explorer of the pair and will run out of her hidey to see what is going on nearly every time someone walks by her cage. Tiki (aka Teacup), a multi colored American/Silkie mix with agouti markings, is more shy and reserved. She is content to stay put and lounge while Twix checks things out. Tiki is a bit harder to catch than Twix, but both girls will sit quietly for snuggle time. One of the cutest and most endearing traits both girls share is how vocal they are. Twix and Tiki are both loud squealers when they think its veggie time and when they'd like fresh hay. Twix will often "yell" so loud that her li ttle ears bob up and down. Contact Allysse at tcgpr@comcast.net if you are interested in adding these two fun girls to your family! This shelter in Fairmont, Minnesota deals mostly with dogs and cats, but occasionally has "pocket pets" brought in though they really aren't set up to care for them. 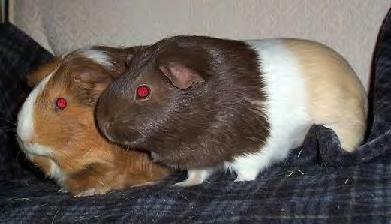 Rural shelters often have difficulty adopting out small animals like guinea pigs as there is little local interest in them. If you live in the SW part of the state and are interested in adopting a rescued guinea pig, rabbit or other small animal please contact the Martin County Humane Society first to see if they have such a pet available. Minneapolis Animal Control in Minneapolis, MN gets small animals like guinea pigs, rabbits, rodents and even birds in fairly frequently. They usually try to find dedicated rescue groups to take these small animals in, but sometimes have them available for adoption at their shelter. In the past Minneapolis Animal Control was commonly called The Pound. However, MAC now has a lovely new shelter, bright and clean, designed with animal comfort and safety in mind. Please consider contacting Minneapolis Animal Control to see if they have any "pocket pets" waiting for a good home. This article and the JPGPR.com logo are &COPY; 1993-2006 Vicki Palmer Nielsen - Jack Pine Guinea Pig Rescue. No copyright is asserted herein regarding the photographs accompanying the article; copyrights, if any, of the photographs are retained by the original holders. If you would like to reproduce anything from the website, please first e-mail Vicki at JPGPR@aol.com for permission.